Summary: Analysis of America on the FM website talk about broken Observation-Orientation-Decision-Action (OODA) Loops. But what does this description mean? What are the consequences? Here’s the second of a series by Chet Richards (Colonel, USAF, retired) explaining this important subject. Once broken, they’re difficult to reassemble. In the last post, I ruminated on what a broken OODA loop is. But what is it that breaks? If any one of these is absent, if it “breaks,” then the OODA loop is broken. Just from looking at the length of the descriptions on this list, you can probably guess where most problems arise: Orientation. To come to grips with this, you have to keep in mind that although we often talk about orientation as a picture, as our impression of reality at some point in time, it really refers to the process of keeping those pictures up to date and projecting them into the future so we can use them as decision models. Or, as Boyd once told me, an orientation is simply a pattern of ideas and actions. Problems occur when the orientation process “locks” in a pattern that isn’t producing accurate representations of reality or, equivalently, decision models that don’t provide effective actions. Suppose, for example, that the “low prices drive sales” orientation suddenly confronts a competitor whose orientation attractor might be described as “insanely great” (and, of course, who has the actions to make it happen). Unless the low price competitor can shift in time to a more effective pattern, they are doomed. 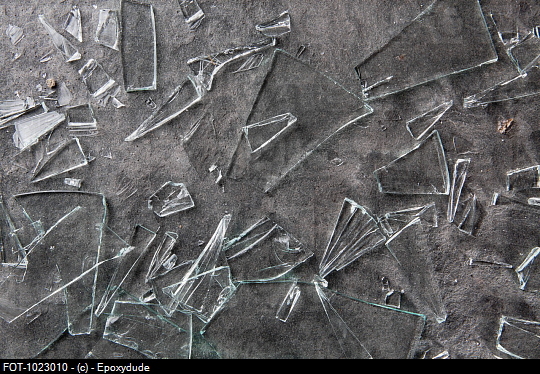 About the photograph: “Broken Glass Shards” by Epoxydude. Boyd’s Real OODA Loop, Fast Transients. John Boyd, Conceptual Spiral, and the meaning of life, Fast Transients. A look at an enemy of America, and a discussion about the execution of al-Awlaki, 13 October 2011 — Facts are less important than our tribal loyalty. I still think it is primarily a decision algorithm. That is why I posted the clip about rules. Every time you go through the loop if the decision rules match(success/correct orientation) keep doing it, if the decision rules don’t match (failure/incorrect orientation) you have to change the rules. If you don’t change then you end up with a broken OODA Loop….it’s the GIGO garbage in/Garbage out. Thanks. That’s what Boyd originally thought, too. But stage models, such as the OODA loop in its sequential form, don’t work very well as decision models. Gary Klein has a nice explanation of why in Sources of Power, pp. 128-130. Basically, as I quoted Jim Storr in “Boyd’s Real OODA Loop,” military units don’t act as if they were going through a series of stages, and for that matter, neither do people. In other words, if you left out the phrase, “Every time you go through the loop,” the rest of the sentence, “if the decision rules match (success/correct orientation) keep doing it, if the decision rules don’t match (failure/incorrect orientation) you have to change the rules” works just as well. In fact, Boyd didn’t provide a decision model, that is, an explanation of what goes on inside Orientation. Klein’s RPD works fine, but others probably would, too. It still seems like when you deal with humans you have to have some kind of order or cycle that you go through or none of this would make sense. Example: after every action you take you (any human being) would observe (see,hear smell some type of primary input) before you continue through the cycle again. I have read Klein and have that book I think I am going to look up your reference. In engineering we call this Control System Theory. Control systems typically break when the feedback loop is positive. The financial system is a good example of this. Investment bubbles grow because people are attracted. The more people that are attracted to the investment, the more it grows, until the limits of the system are reached and the system crashes. Wikipedia entry on Nonlinear systems control. All true, of course, except that Boyd wasn’t using the “loop” as a model of a control mechanism. Your example is a good reason why. In fact what you’d like to do is get your opponents trapped in such a loop (Spinney coined the term “incestuous amplification” to denote the effect in groups of people). Boyd hated the term “control.” He thought it was mechanistic, top-down, and robbed the people in the organization of creativity and initiative: “control means to regulate, restrain, or hold to a certain standard as well as to direct or command.” (Organic Design, 32) Mike Wyly, one of the founders of maneuver warfare in the USMC, put it nicely when he said that he didn’t want to “control” his marines; he wanted to unleash them on the enemy. Question is how do you do this in a way that accomplishes the mission? Boyd’s answer was that first you establish mutual trust and cohesion (Einheit). Then most people in the unit will want to accomplish the mission, so you only need to guide and lead them, not control them. The two primary tools you have for doing this are the commander’s intent and mission orders. And of course, the personal presence of the commander at the time and place where he or she can have the most influence on the situation. None of this is to say that you don’t take action if you feel that things aren’t moving along as you think they should. But this should be regarded as the exception, not as your primary “control” mechanism. Everyone has discussed broken OODA loops as though they just happen, through cupidity or bad luck or delusion. But here in America in 2012, quite a few highly intelligent wealthy people make a great deal of money out of deliberately breaking our OODA loops. Someone mentioned David Brin recently. This guy lives in a 1.3 million dollar mansion (on which we pays taxes of only 0.6%, thanks to the state of California) and he makes most of his money not from writing science fiction but from consulting for criminal corporations like IBM (whose CEO was recently indicted) that have energetically shipped their entire workforce overseas. Brin lavishes praise on America’s catastrophically broken military-industrial complex and enthuses “I have no problem with our military spending.” Brin adores the idea of slashing social security and medicare for the bottom 99% and has often written in favor of crazy proposals like raising the age for medicare eligibility and social security eligibility. As a single-person Delaware service corporation, Brin pays next to no taxes since he writes off almost all his expenses as corporate costs. Yet Brin claims to be in favor of the little guy, the average person — and in this Brin behaves exactly like Obama, who talks up his alleged support for the average middle-class American while enthusiastically implementing policies that are destroying the American middle class and accelerating America’s decay. We see the same pattern of talking as though they support a functional justice system and an economy that pays a living wage for middle class Americans while supporting policies that do exactly the opposite from Niall Ferguson and David Brooks and Thomas Friedman. All these pundits, along with David Brin and Barack Obama, speak words of populist reform, while advocating policies that do exactly the opposite. All these people seem to have realized that if they can dupe the public by claiming to do one thing, even as they actually do another, they can have it all: the public adores them, while the top 1% lavish these pundits with vast wealth for helping consolidate the oligarchs’ hold on American society. Just take a look at breathtaking spectacles like Barack Obama castigating the Syrians for brutally repressing demonstrators calling for freedom and justice, while Obama signs off on selling military weapons to the Chicago police force to brutally repress demonstrators calling for freedom and justice at the recent G20 meeting. Get a load of Hillary Clinton raging against the Chinese government for its use of widescale internet censorship, even as Hillary Clinton and the rest of the Obama administration enthusiastically advocate massive internet censorship projects like the “six strikes” system scheduled to go live throughout American ISPs this fall. You quickly realize that vast amounts of money are to be made by pundits who deliberately break America’s OODA loops at the behest of the oligarchs and giant corporate monopolies that rule our country.